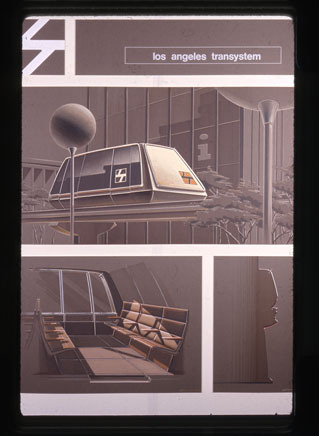 Looking ahead twenty years to 1990, the “Los Angeles Transystem” Advanced Transportation Design project taught by Strother MacMinn, involved students looking at the community’s need for new public transportation systems as an opportunity in design evolution. The challenge also meant a broader scope of transportation design thinking and, a chance to demonstrate their employment capability in wider and more versatile fields. They concentrated on the downtown area of Los Angeles as a focus point for a variety of public systems and the student group then contacted the City Planning Department for help. A final presentation of this project was made to local industrial designers, members of the City Planning Department and executives of Transportation Technology, Inc. This encouraged a steady flow of city planners and transportation designers to visit the project at Art Center. Following that, it was moved to the rotunda of the Los Angeles City Hall and then shown at the office of Home Savings and Loan. 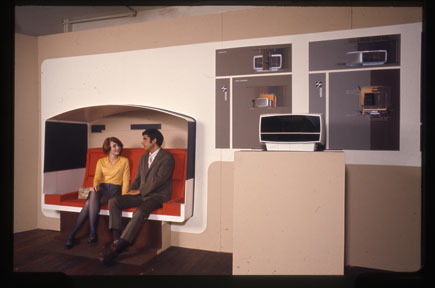 The Art Center Archives has roughly 50 slides documenting the project. Los Angeles Transystem, 1970. (2004.23.1304). Photographer unknown. Los Angeles Transystem, 1970. (2004.23.1302). Photographer unknown. By Robert Dirig in Uncategorized on October 7, 2013 .